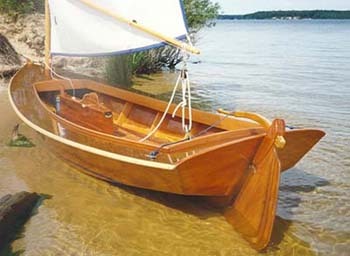 WINDWARD 15 is based on a Chesapeake Bay crabbing skiff I designed for my nephew (Eric Flickinger). Eric built her and has sailed and beach-cruised the length of the Chesapeake Bay. He took a tent and set up where beaches were available and slept in the cockpit under a boom tent and anchored out when needed. Her Vee hull and simple rig provides a surprising turn of speed. She made the last half of the upper Bay in two days sailing. The WINDWARD 15 has become one of the most popular small boat designs we offer. Her spacious cockpit provides room for cruising gear or family and friends. The sprit boom sail is easy to rig. You can be underway in minutes. She is easy to handle to windward and well behaved downwind. Glue and screw construction is 3/8" plywood and epoxy, watertight and long lasting for years of enjoyment. 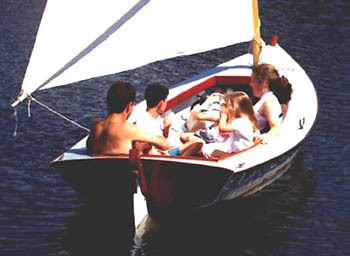 See WoodenBoat (May/June 1989, Issue Number 88) for a design review. She issuitable for first time builders. Plans include: materials, lines, set up, a construction, and sail plan. A full size frame plan is available. Estimated cost for quality construction materials (not including sails) is $5000. This cost includes a high level of outfit and finish you can be proud of after putting the effort into building this fine boat. Purchase and Download Study Plans for the WINDWARD 15 for $5.00 in PDF format (zipped file). Purchase Construction Plans for the WINDWARD 15 for $75.00 for delivery by US Postal Service. Purchase Full Size Frame Lofting for the WINDWARD 15 for $75.00 for delivery by US Postal Service.